It has been my aim with every Freshly Blogged challenge to use all of the ingredients we have been given in the most creative way I possibly can, while staying true to my cooking style. This week I used the ingredients as inspiration to make a version of Spanakorizo. This vegetarian dish is of Greek origin and usually includes only spinach and rice. I wanted to incorporate all of the ingredients into a one pot wonder that not only is pleasing to the palate, but that can be versatile enough to satisfy any vegetarian, as well as make a great accompaniment as a side dish. Dave and I had this for supper on Friday night with venison, and on Saturday night with chicken livers and on Sunday night with a crayfish curry. It worked well as a stand alone dish and together with all the other things I added to it. So, mission accomplished. Not only that, it can be prepared in advance and even served cold as a salad. Top it with an egg for a great light lunch. Sadly, I was chopped from the competition for my submission of a terrine the judges thought was a quiche and a pavlova that they did not find inspiring. I must say that the inspiration was lost when they added vinegar and corn flour to our pantry ingredients after I was told I could not use them, but another blogger did. My lack of enthusiasm for participating in a competition where the rules kept changing to suit one blogger clearly showed in my submission. Looks lovely and fresh. I’d never heard of the original Greek dish, so that’s something to look out for too. Sounds like they gave you feedback then? I still have no idea why I got chopped! But by now am only mildly curious. Agree it was very frustrating to be told different things by different people at different times, made my shopping slightly more stressful than usual, as I was DMing them to find things out as I went! This is our type of meal. Love rice dishes that can be prepared ahead (and doubled!). It is a great meal, and maybe could even be packed as a school lunch? So tasty – think even Pete wouldn’t miss meat in this lovely dish. 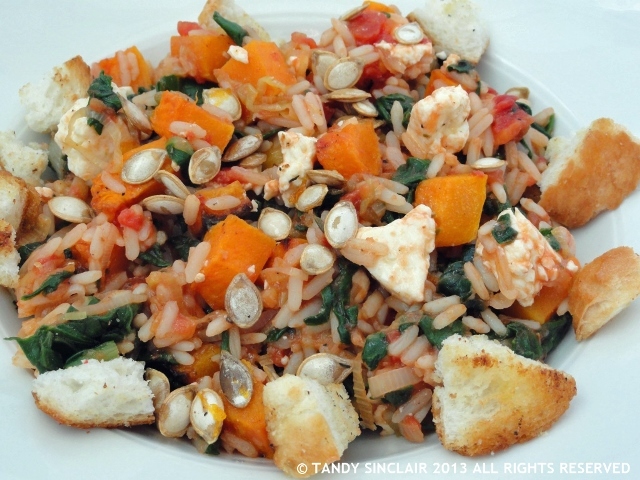 I love butternut squash and this looks yum! I would be frustrated with the freshly blogged cutting also! Sounds so unfair. The rules should be the same for everyone throughout the competition!! Well, in any event, this spanakorizo looks amazing! I love that you put butternut in it! Butternut squash is such a beauty, this is the first time I have heard of spanakorizo! This is a great vegetarian dish Uru! That looks and sounds amazing – had never heard of it! This sounds delicious! I love butternut squash.